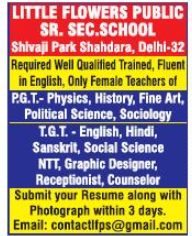 Little Flowers Public Sr. Sec School, Delhi has advertised in Hindustan Times Newspaper for the recruitment of PGT plus TGT job vacancies. Interested and eligible job aspirants are requested to apply with in 3 days. Check out further more details below. About School: Little Flowers Public sr. Sec. School was established in 1975.The School is regarded as the Best School in Trans-Yamuna area and always stands First in Academic and Co-curricular Activities. School secured almost 100% Results in C.B.S.E. X & XII for last 35 years. L .F.P.S. Students have been participating in all Cultural Competitions and co-curricular activities and gets 1st & 2nd prize at Zonal, District & State level.